It’s a cop’s worst nightmare: no, not getting assigned to Segway patrol—a skateboard with a can of spray paint attached. Hoping to bring his two lifelong passions together, British street artist D*Face, a.k.a. Dean Stockton, masterminded the freaky instrument of mayhem. 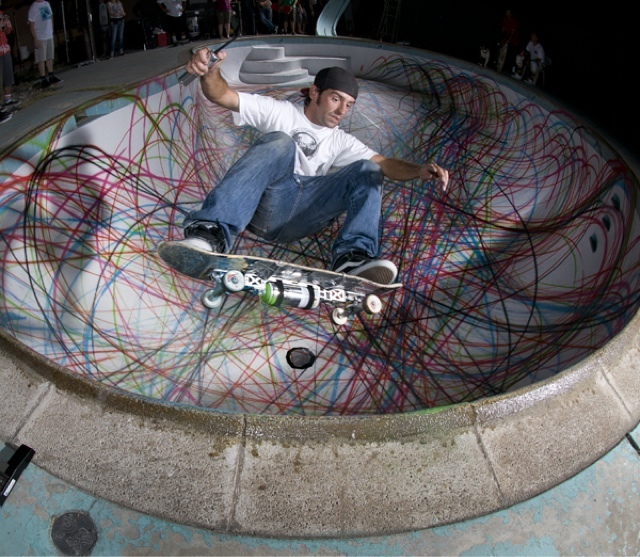 “I thought about how I could document or record the paths of the skaters,” Stockton says. He was inspired in part by long-exposure light-trail photos and a TV commercial for a kids’ scooter with chalk attached.